37 Fried Puffs. 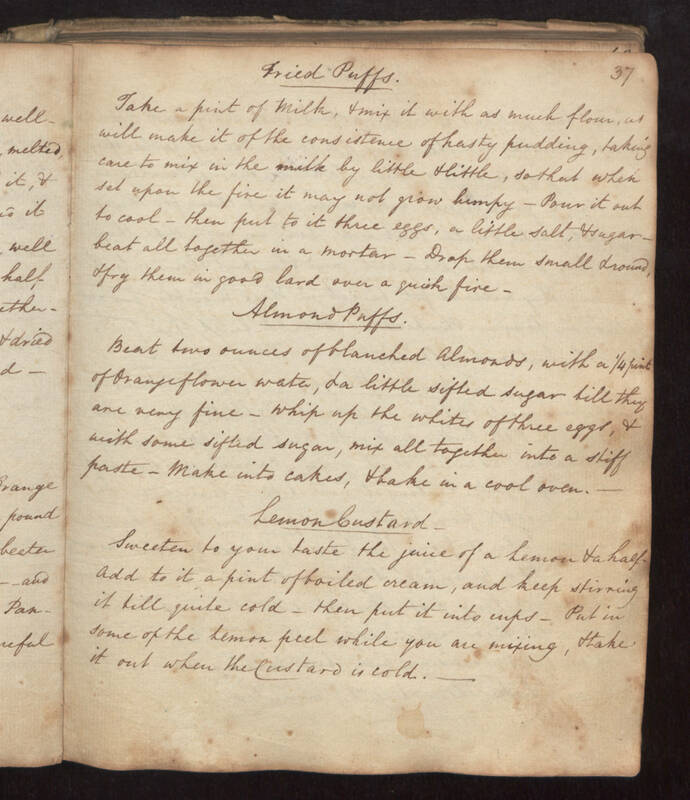 Take a pint of Milk, & mix it with as much flour, as will make it of the consistence of hasty pudding, taking care to mix in the milk by little & little, so that when set upon the fire it may not grow lumpy - Pour it out to cool - then put to it three eggs, a little Salt, & sugar - beat all together in a mortar - Drop them small & round, & fry them in good lard over a quick fire - Almond Puffs. Beat two ounces of blanched Almonds, with a 1/4 pint of Orange flower water, & a little sifted sugar till they are very fine - whip up the whites of three eggs, & with some sifted sugar, mix all together into a stiff paste - Make into cakes, & bake in a cool oven. Lemon Custard Sweeten to your taste the juice of a Lemon & a half. Add to it a pint of boiled cream, and keep stirring it till quite cold - then put it into cups - Put in some of the lemon peel while your are mixing, & take it out when the Custard is cold.